Learn Infant Massage – Pre-Registered 3 Class – Group Program 3 weeks old to 1 year old. CONNECT WITH YOUR INFANT IN A WHOLE NEW WAY & RECEIVE A CERTIFICATE OF COMPLETION YOU CAN DISPLAY IN YOUR NURSERY. Connect with your infant in a whole new way. 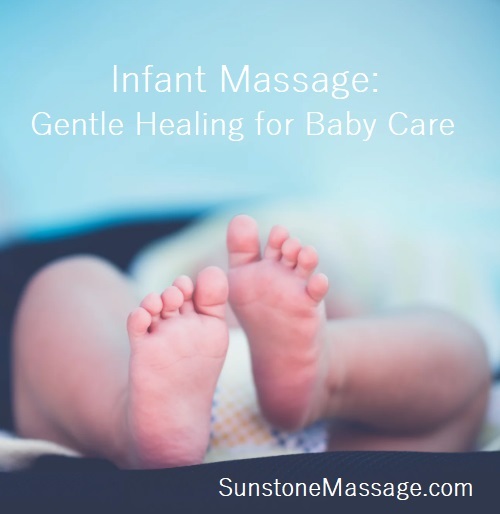 BENEFITS OF INFANT MASSAGE: Massage therapy for babies helps to manipulate soft tissues that are responsible for the betterment of health and wellness in infants and babies. ‣ BONDING, ATTACHMENT, RESPECT and TRUST. ‣ IMPROVED SLEEP for Everyone! ‣ DEVELOPS HEALTHY TOUCH UNDERSTANDING AND PROMOTES HEALTHY BOUNDARIES AS CHILD GROWS. ‣ DECREASE ANXIETY AND STRESS IN YOURSELF AND YOUR CHILD. Details for each event will be available on our Website and on our social media pages!